The AHA PALS Online Course has been updated to reflect new science in the 2015 AHA Guidelines Update for CPR and ECC. 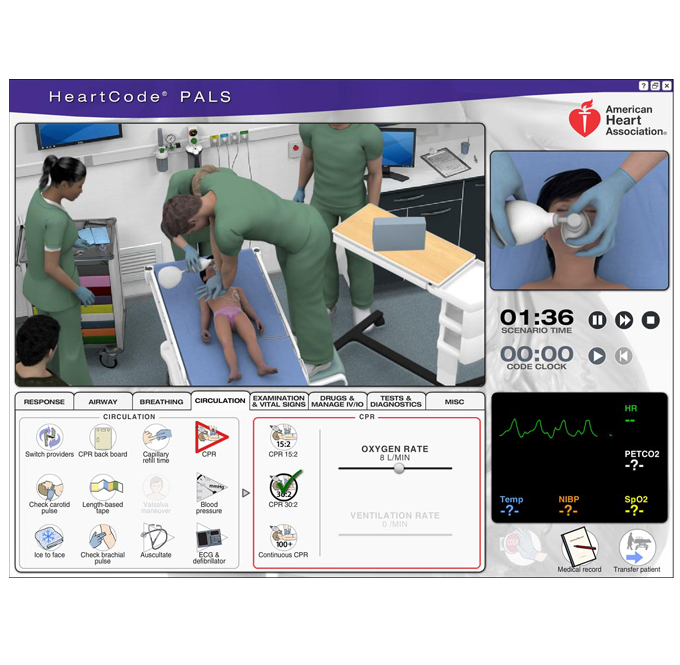 PALS uses a series of videos and simulated pediatric emergencies to reinforce the important concepts of a systematic approach to pediatric assessment, basic life support, PALS treatment algorithms, effective resuscitation, and team dynamics. The goal of the PALS Course is to improve the quality of care provided to seriously ill or injured children, resulting in improved outcomes. Students who successfully complete the PALS Course (including achieving a score of 84% or higher on the course exam) will receive a PALS Provider course completion card (print or eCard), valid for two years. 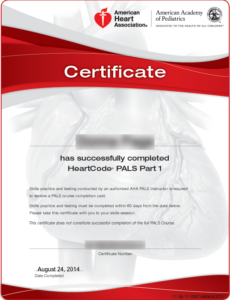 Product Information: HeartCode PALS is the AHA’s blended learning delivery method for the AHA’s PALS Course. Blended learning is a combination of eLearning, in which a student completes part of the course in a self-directed manner, followed by a hands-on session. HeartCode PALS is an online comprehensive eLearning program that uses eSimulation technology to allow students to assess and treat patients in virtual healthcare settings. In this environment, students apply their knowledge to real-time decision-making and skills development. To enter the course, students must complete the PALS Precourse Self-Assessment. Students are then presented with 12 In-hospital patient cases and a team dynamics lesson. Cases may be repeated as many times as necessary to pass. Upon successful completion of all the patient cases, students must pass the multiple choice exam with a minimum score of 84%. physicians — American Heart Association designates this enduring material for a maximum of 7.25 AMA PRA Category 1 Credits™. Physicians should claim only the credit commensurate with the extent of their participation in the activity. physician assistants — AAPA accepts certificates of participation for educational activities certified for AMA PRA Category 1 Credit™ from organizations accredited by ACCME or a recognized state medical society. Physician assistants may receive a maximum of 7.25 hours of Category I credit for completing this program. nurse practitioners — American Academy of Nurse Practitioners (AANP) accepts AMA PRA Category 1 Credit™ from organizations accredited by ACCME (must be claimed within 6 months of participation). nurses — The maximum number of hours awarded for this CE activity is 6.50 contact hours (must be claimed within 6 months of participation). pharmacists — ACPE Credit: 8.00 Contact Hours. Universal Program Number: 0256-0000-17-914-H01-P (must be claimed within 30 days of participation). emergency medical services — This continuing education activity is approved by American Heart Association, an organization accredited by the Commission on Accreditation for Pre-Hospital Continuing Education (CAPCE), for 5.75 Advanced CEHs, activity number 17-AMHA-F3-0346 (must be claimed within 6 months of participation). Does HeartCode PALS require special software? What happens when the computer work is done? How do I get my PALS card? You will need to have an American Heart Association™ PALS instructor complete the skills check off and issue your AHA course card.